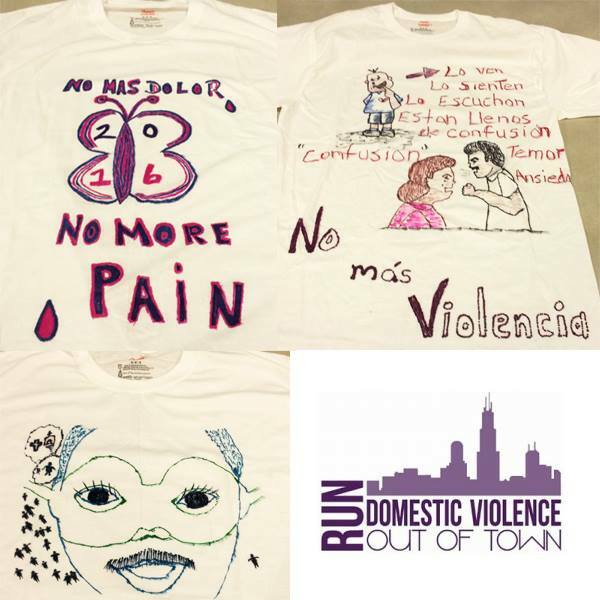 Feb. 4 2015: Juanita Berry runs a biweekly support group called Pa Lante (para adelante) for Spanish-speaking domestic violence survivors out of North center. She surprised them with a Valentine's Day party. In keeping with her focus on teaching skills for financial independence, she asked the women to buy thrift-store outfits and model them. Metropolitan Family Services North said goodbye to retiring Family Violence Intervention Program therapist Juanita Berry last week, but North Center clients will continue to benefit from her support group Pa Lante, which has made a deep and lasting impact on the Spanish-speaking domestic violence survivors who attend. Short for “para adelante,” or “moving forward,” Pa Lante meets twice a month and provides much more than a place to talk – it serves as a hub for Metropolitan’s wraparound services. Clients receive individual therapy as well, and many also work with Metropolitan’s Legal Aid Society to get orders of protection, child support, and divorces. One support group participant described Juanita as “like a mother,” but also as “strict” – she focused on helping the women establish financial independence, and brought Financial Opportunity Center coach Vincent Perry to a meeting to teach them financial literacy skills. She also invited a speaker to talk about nutrition, coordinated the group’s participation in the Clothesline Project, and held a “self-esteem party” for Valentine’s Day where the women walked an imaginary catwalk to model their thrift-store fashions and help each other practice self-care. Pa Lante participants said the group has changed their lives. One client met with State Representatives Will Guzzardi and Robert Martwick to tell them about the success she has achieved with the help of Metropolitan’s wraparound services. Her story resonated with Rep. Martwick, who spent years as a DV prosecutor and is a strong advocate for violence intervention/prevention. Program supervisor Jennifer Jenks, along with Maria Loya and Nancy Ayala, are continuing to run the group, creating a legacy of hope for domestic violence survivors. Several Metropolitan staff members will be running the Bank of America Chicago Marathon this year as part of Team Run Domestic Violence Out of Town. All funds raised will go to Chicago-area domestic violence programs, including those run by Metropolitan. For more information, to run in the half marathon or 5K, or to support a runner, please visit rundvoutoftown.org.